At age 73, Paul Revere is still at it. 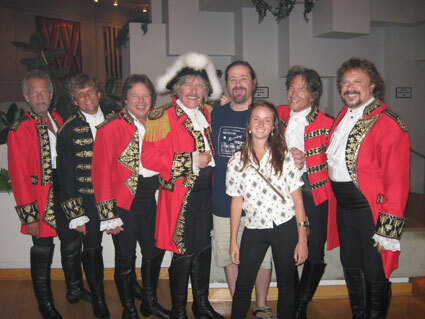 In early 2010 I was doing research and conducting interviews for a feature on Paul Revere and the Raiders for British print magazine Shindig. (That story is here.) Despite my persistent efforts, I couldn’t secure an interview with Paul Revere himself. He wasn’t being cagey or uncooperative; he was attending to family matters. Facing a deadline, I looked for a way to compensate for the omission in my research, and in the end I drew upon on select quotes from a recent interview Revere had given to producer and music historian Ed Osborne. But I really missed having the opportunity to speak with the bandleader. I was fortunate enough to get extensive interview time with Phil “Fang” Volk (bass 1965-67), Jim “Harpo” Valley (lead guitar 1966-67), Keith Allison (bass 1968-75), Mark Lindsay (vocals/sax 1958-75) and manager Roger Hart. Most of the other major- or semi-major characters in the Raiders story were either unavailable (Freddy Weller) or had passed away (Drake Levin and Mike Smith). So I had pretty well covered the bases, but…no Revere. Paul Revere is in many ways unique in the rock’n’roll world; less so in the world of showbiz in general. Unlike many of his rock contemporaries (but similar to some well-known pre-rock musical figures), Revere was neither front man, nor songwriter, nor vocalist of the band that bore his name. The only rock corollary to Revere’s role might have been Dave Clark (of the eponymous Five). And in fact that’s an apt comparison, since Clark is also known as a shrewd businessman. I won’t needlessly recount the band’s history here; for that I would humbly recommend my original story and Ed Osborne’s liner notes for the 2010 3CD set The Complete Columbia Singles. (That collection is reviewed here.) Suffice to say that Paul Revere was, is and remains an entertainer. Which, quite neatly, brings us to present day. Well, almost. First, a bit of background on how we got here. In 1975, after an especially desultory series of live dates at such places as Knott’s Berry Farm, charismatic frontman Mark Lindsay finally left the Raiders. For many years the group had been essentially a Lindsay vehicle; one the vocalist helmed effectively. Lindsay wrote or co-wrote a great deal of the band’s music, produced the albums, and tried gamely to push the band (on record, at least) in some interesting directions. But by the very late 1960s, the ship had sailed on the brand of pop-rock at which the Raiders were so adept. Despite a number of fine singles and albums, by the early 70s, the Raiders were all but finished as a recording entity; nobody wanted to know. A few halfhearted stabs at various pop styles yielded little in the way of chart action or critical acclaim (or notice, for that matter). But onstage, the group remained a draw. While they had dropped the trademark stylized uniforms in 1968, by the 70s the costumes were back, along with Vegas dates and the like. Revere, being the bandleader (but, as I’ve mentioned, neither songwriter nor vocalist) was concerned primarily with showing the audience a good time. I’ll repeat that for emphasis: Showing The Audience A Good Time. What that meant in practical terms was that Revere was largely unburdened by creative aspirations of self-expression. He wasn’t concerned with getting a particular worldview or message across; he wanted to rock, as it were. So if the band personnel changed, that wouldn’t be a problem as long as the new guys learned the songs (and, often, the choreography). No albums or chart action? Fine; even in the band’s mid-60s heyday Revere was more interested in the shows than the records; he often didn’t even play on the latter, leaving keyboard duties instead to Lindsay, producer Terry Melcher, Phil Volk, sessioner Glen D. Hardin and even Van Dyke Parks one time. So when Lindsay left, Revere did what he always did when members left: he replaced him with another vocalist, and soldiered on. More shows, more giving the people what they wanted. 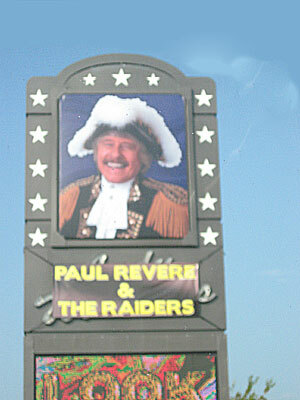 Remarkably, in a world where rock musicians take the cash and retire, Revere continued to play shows. With the exception of a brief period in the 1970s, Paul Revere has continued to keep a set of Raiders out there performing. And here’s what’s even more remarkable: his band lineup is more consistent today than it ever was in the 1960s. Freed from the demands of record labels, radio station airplay and songwriting publishers, he’s found guys who just want to entertain. Bassist Ron Foos joined the band right around the time Lindsay left, and he remains in the band today. Current guitarist Doug Heath joined even earlier, in 1973. Danny Krause (keyboards) joined in the very early 80s, which (to some) might not seem like that long ago, but he too has been with Revere more than thirty years. 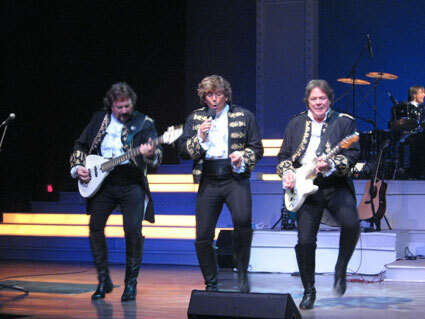 With the exception of the odd show-souvenir release, there hasn’t been much in the way of new music from Paul Revere and the Raiders since their last single in 1975 (a discofied non-Lindsay misstep best left unremembered). But of course that’s not the point, nor the goal. On with the show, Revere might say. 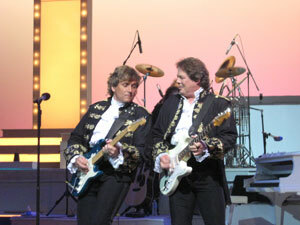 In 2010 — as in previous years — Revere’s band enjoys a residency at the Andy Williams Moon River Theater in Branson MO. While Branson is certainly a kitschy tourist destination — people who’ve visited Gatlinburg TN would recognize the, um, aesthetic approach — it is something of a Mecca for family entertainment. And that isn’t too wide of the mark of what the Raiders serve up. 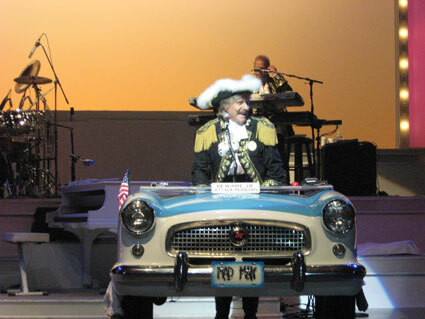 Onstage, Paul Revere is (perhaps a bit surprisingly) quite irreverent in his attitude toward his band’s body of work. He has no compunction about cutting the songs short, down to their hooky essence: some songs last merely a minute, enough to (one hopes) satiate the audience’s desire to hear, say, a hit from 1966. And Revere’s trademark nutty onstage banter — so well-rehearsed he doubtless could recite it in his sleep — makes the self-deprecating point that the monster hit “Just Like Me” was a shameless attempt to rewrite/recycle “Louie, Louie” by, as he says, “playing it backwards.” He deconstructs the song right there in front of the audience, and gets the Big Laugh for doing so. It’s all about fun with Revere. The show is well-paced, and even though there are lengthy stretches of dialogue and shtick, the focus remains on the music. New-ish vocalist Darren Dowler is a singer in the all-around-entertainer mold, and he’s able to rock convincingly one minute, and turn in a soaring ballad performance the next. And while all the players — the aforementioned musicians plus new member (former late-period Buckinghams drummer) Tommy Scheckel — are clearly adept at a wide range of styles, with Revere they mostly just plain rock. Which is as it should be. During my research for the Raiders story, a vicious whispered rumor occasionally crept up (though, quite notably, not from anyone actually in a position to know). The story went that Revere wasn’t actually much of a keyboard player. Or, at least, not any more. Yes, he played boogie-woogie piano on many early Raiders sides (and b-sides) but, the story went, since he was mugging and miming keyboard work on the Vox organ in all those Where the Action Is episodes, he didn’t/couldn’t play. Nothing — repeat, nothing — could be farther from the truth. To make that point (or, more likely, just because it’s fun and entertaining), Revere takes a lengthy solo at the piano during the band’s shows. Not only does he play accurately, frenetically, powerfully, but he leaps about while doing so. His prowess and enthusiasm would shame a player half (or a quarter) his age. 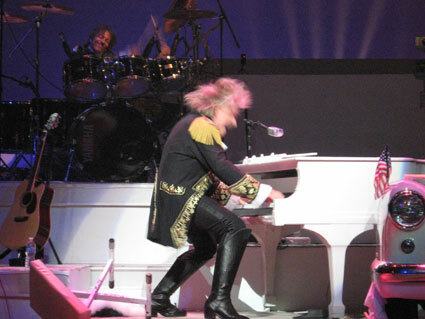 True, the car-grille keyboard he uses for most of the show is as much a prop as it is an instrument, and Danny Krause is responsible for more of the group’s sound than might at first appear, but nobody gives — for example — Paul McCartney a hard time about his musical director, Paul “Wix” Wickens. When the show ends, the entertainment — the solid commitment to bringing joy to the audience — does not end. True, many bands do meet-n-greet sessions after their shows, and in Branson this is perhaps more true than in other places. But — after a quick costume change into another set of uniforms — Revere and all of his merry Raiders reappear in the Moon River Theater’s lobby to sign autographs, pose for photos, and generally hang out and visit with fans. Thanks to the gracious hospitality of bassist Ron Foos, I was fortunate to get even more time with the band than did the average audience member. After the show I spoke briefly with Revere, explaining who I was. He asked me to wait around until the autograph line played out, at which time we engaged in a friendly conversation of moderate length. It wasn’t, perhaps, that long-sought interview I had hoped for (I did have my recorder and a list of questions at the ready, just in case) but neither was it a rote “nice to meet ya” conversation. My plan had been to bring along the LP sleeve from the Raiders album Spirit of ’67 for Revere to autograph. I had mailed the sleeve to three former Raiders (Mark Lindsay, Phil Volk and Jim Valley) but when I left for the long drive to Branson, the sleeve hadn’t made it back to me quite yet. Lucky for me I had another copy, and Paul Revere was kind enough to sign that one. So now I have one with his signature, and another with the other three (that’s everyone pictured on the cover, save drummer Mike Smith who passed away in 2001). The night I saw the band was the last of that particular Branson run, and they were scheduled to leave town in the morning. So were we, as it turned out. So after our brief visit we said our goodbyes. But before we could leave, Revere called all of his bandmates to attention, and gathered them all together to pose for a photo with me and my daughter. What a guy. 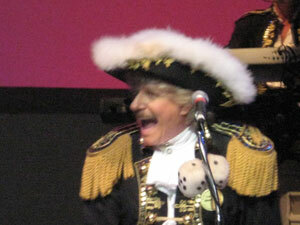 In 2011 Paul Revere and the Raiders continue to do their Branson residencies, selected dates around the country, and even some of those cruise ship gigs so popular these days. Anyone with nostalgia for the music of prime-era Raiders will enjoy a performance by the current band. And while normally I’d caution that since the performer is 73 years old, you’d better hurry (since he might retire at any moment), Paul Revere shows no sign of slowing down.